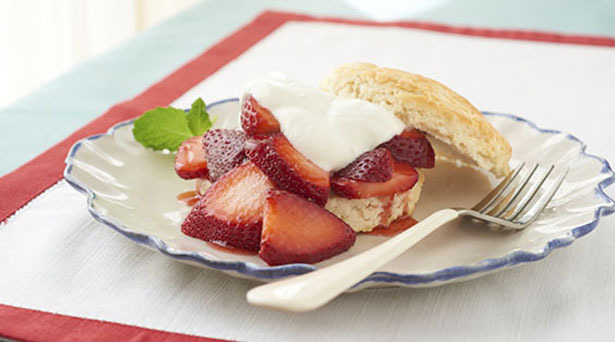 These classic strawberry shortcakes feature homemade buttermilk biscuits and a topping of Greek yogurt. Combine strawberries and sugar in a small bowl and let stand 20-30 minutes. Grate frozen butter using large holes of a box grater. Toss together grated butter and flour in a medium bowl. Chill 10 minutes. Make a well in center of mixture. Add buttermilk and stir 15 times. Dough will be sticky. Turn dough out onto a lightly floured surface. Lightly sprinkle flour over top of dough. Using a lightly floured rolling pin, roll dough into a 3/4-inch-thick rectangle. Fold dough in half, so short ends meet. Repeat rolling and folding process four more times. Split biscuits in half. Spoon strawberries evenly over bottom halves of biscuits and top with a dollop of yogurt. Top with remaining biscuit halves. Garnish with fresh mint, if desired.